Breathtaking is the right word. People around me are always getting on planes, going to exotic locations, renting Winnebagos once there. "Have you been to Patagonia yet?" "Have you been to the Himalayas yet?" No. I live surrounded by beautiful nature and culture already. Why would I put extra helpings of coal and oil into the fire? I want to say to them: you people are young and I want to admire you for the potential you have, for your energy and smiles. But the gulf between words and actions is just too damn high. I have a friend who is a member of the Green Party and on a city council. How many times over the years have we discussed the necessity to find the joy and depth in your own backyard? Didn't matter. The whole family went to Thailand last summer. I'm grumpy because I can't even usefully contrast my friends with those scintillating peacocks on the world stage. Can't I have that one thing? Grr. Understood. As the old Stoics used to point out, though, you have the power to contrast your friends and the peacocks alike with one thing: yourself. She seems to enjoy the privileged lifestyle of the elites, that's for sure. Makes me ashamed of my Norwegian ancestry, as well as a stark reminder of my own transgressions - several trips to Europe and Hawaii, including business travel on corporate jets around the U.S. The hypocrisy of creating a huge carbon footprint in spite of knowing the environmental impact is an easy trap to fall into. Sort of the like the diabetic who swings by the dessert bar at the lunch buffet. I read recently in the German online science magazine "Spektrum" about an environmental-friendly diet which all 7 billion people would have to adopt to save the environment. Was this the diet that you mentioned? It is quite breathtaking to contemplate that anyone could even assume that it is possible to bully all the inhabitants on Earth on every continent to change their diet. And then there is the fact that even in cookbooks which purport to propagate simple, cost-effective diets, the recipes are of a certain complexity with more or less exotic, not-everyday ingredients included. That's the one -- and yes, I've noticed the same thing about recipes. If you ever want to get an entertaining reaction from a bunch of privileged, environmentally conscious diet activists, suggest that they try plain old rice and beans. "But -- but -- but -- that's what poor people eat!" You won't usually get that in so many words, but that's the underlying logic. I eat rice and beans regularly, btw. I've been poor -- it's kind of traditional for writers! -- and picked up a taste for it when that was one of the few ways we could get a good solid nutritious meal that wouldn't strain the budget. My wife and I are financially pretty comfortable now -- well, by our standards (your standard privileged middle class American would shriek in horror at the thought of living my pleasant, comfortable, environmentally conscious lifestyle, but that's their problem, not mine) -- but we haven't greatly changed the way we eat, as our diet pleases us and we don't worry about trying to compete in the middle class status wars. I was recently invited by a friend to attend a seminar he was organizing on the topic of "green thinking". That term turned out to be very appropriate, because it soon became clear that everything "green" was indeed confined to the world of thinking. At the seminar we talked about cognitive dissonance and how to overcome it. The example they used was that of the environmentalist who rationalizes to himself it's okay for him to fly. After the seminar I thanked my friend for the discussion and asked him what he was going to do in the evening. He told me he was going home to book a flight for his holiday in Turkey! Apparently he saw no contradiction in this. As Upton Sinclair said, "It's difficult to get a man to understand something, when his salary depends upon his not understanding it." My friend wasn't getting any salary, but he was winning the approval of his professors and the cute girls in his class! This incident convinced me that the proper attitude to the academic environmentalist scene is to stay as far away from it as possible. I wonder if your friend was using the discussion of cognitive dissonance as an instruction manual -- "here's how you compartmentalize your life so that your loudly proclaimed ideals don't get in the way of being a good little consumer." As for the academic environmentalist scene, though, no argument there. I saw the same point being made in Norwegian media about the meeting in Davos. And rightly so. I'm glad to hear that this kind of critique is starting to get some traction. It's when privileged activists get publicly shamed for telling everyone else to conserve carbon, when they so obviously aren't willing to do it themselves, that we may begin to see some real change. I manage to eat quite well and that usually involves about half a rasher a day, which is normally consumed when I eat elsewhere and off the property. At home I try to eat as much from the garden as humanly possible. People get funny though if I tell them I'm vegetarian, so I just go with the flow and eat whatever. And most vegetarian food purchased from restaurants is not really that good – probably because it isn’t straight from the garden. Mate, we just had record breaking heatwaves down here. It was not good at all, and yesterday was extraordinarily horrific and it could have left me being homeless due to the extreme and bonkers fire risk. You don't have to tell me about global warming, I live that stuff. Sorry I'm grumbling due to fatigue, I guess. A charity mugger from Greenpeace once tried to shake me down for some mad cash to help save the Great Barrier Reef. It's a worthy cause, and I spoke with him about all the stuff I was doing and concluded by pointing at all of the traffic and shops and people and remarked that: 'Mate look around you. None of this stuff is sustainable'. And then, here's the kicker, he said to me: 'I feel sorry for you'. Wow. I walked off as my time was better spent elsewhere. People like their stuff and they always plead special circumstances. It is what they do. Re: The Cheese is good! Oh, granted. I'm no fan of the IEA, but it's good to see them realizing that the privileged end of the environmental movement really is a target-rich environment! Will those posts resume at any time soon, ir do I need to go to this dreamwidth site to read what you have to say? Nah, I'm just taking a break from blogging. As I mentioned at the end of my last December post, I've taken January 2019 off, and the next post on Ecosophia.net will go up on February 6. To tie in with the recent turn of the residual conversation on the blog, I noted her invocation of morality at the end of the piece. My diet is subject to her morals, but her travel is not...apparently. I hope that more people continue to comment on the gaps between words and action like this. We might see change come out of it. I really am starting to think at this point that some serious discussion of moral philosophy might be worthwhile on the main blog. What I'm going to christen the Stordalen Syndrome -- "I'm going to try to pressure the world into embracing this bit of virtue signaling I like, while the rest of my life gives a lie to my supposed values" -- is immensely popular these days, and can use some exploration. Let's see... The number of (food) calories in a bacon cheeseburger is going to vary wildly depending on how exactly the restaurant is preparing the cheeseburger, but I've consistently seen values of 500-900 kcal. Of course, we aren't talking about nutrition here, but about the energy needed to actually *make* the bacon cheeseburger in the first place. Suppose our bacon cheeseburger has a 1/3 lb. beef patty. According to https://www.treehugger.com/green-food/energy-required-to-produce-a-pound-of-food.html (source 1), beef production is 1176 kcal/lb so this patty required 392 kcal to produce, plus the energy needed to transport it from the ranch to the restaurant. Pork production is 480 kcal/lb (source 1), but the couple of strips of bacon that turn a regular cheeseburger into a bacon cheeseburger weigh much less than a pound. A typical bacon cheeseburger probably has 2 half-strips (i.e. 1 strip) of bacon on it, and it's 16-20 strips of bacon to a pound (source 2: https://www.thespruceeats.com/bacon-equivalents-and-substitutions-1807458), so we'll take the medium and call 1 strip bacon = 1/18 lb, i.e. 27 kcal production. Cheese production is 1824 kcal/lb (source 1) and weighs 0.6 oz/slice (source: https://www.reference.com/food/many-ounces-slice-cheese-14dc65ec1efe34b6). Let's assume this is a particularly cheesy cheeseburger and has 2 slices' worth of cheese on it = 1.2 oz = 0.075 lb = 137 kcal production. So the bacon, beef, and cheese in the burger require 556 kcal of energy to produce. Of course, we still have to account for the buns, lettuce, tomato, ketchup, and mayonnaise, but these being the vegan components of the burger, we'd have to eat them anyway, and we are interested only in the marginal cost. Let's double this energy figure (to 1112 kcal) to take into account the transporting of the animal products, since odds are we're sourcing everything from monocropped Big Agriculture ranches rather than everything from the same local family farm. Now for the airplane: The article JMG linked cites that she has a Bombardier Challenger 350. I couldn't find fuel stats for the 350 but Wikipedia has them for the 300, at 1,007 L of jet fuel per hour of flight time and a cruising speed of 850 km/h. This equates to 1.185 L/km. Jet fuel is approximately 35 MJ/L = 41.5 MJ/km, which means that if she is flying from Oslo to Marrakesh (3,436 km per Google Earth), the *one-way* flight costs 142,594 MJ = 34.1 million food calories, doubled to 68.2 million because the guests have to return after the wedding. Divide this by 237 because that's the number of guests = 287,800 food calories/guest *each way*, which is more than 250 bacon cheeseburgers' worth of food production (per guest). Gallivanting around the world with only herself and husband in tow would take even more calories per capita, since now you're only dividing by 2. Thank you for this! One of the pleasures of having the lively and diverse readership I do is that I can pose questions like this, and have people who are actually good at math answer them. Which do you think is worse, a hypocrite like Gunhild Stordalen, or someone who uses her existence as excuse to do nothing? To be honest, I don't see a penny's worth of difference between them. One irritated middle aged crank to another, I'm tired of excuses, no matter who is making them or what their class affiliation. There will always be hypocrites, but doing nothing in a crisis because other people are shameful is shameful. Sorry, I've just come home from the farmer's market where everything is in plastic. And I didn't buy any of it. Loudly. Grump grump. Did you think I was doing nothing because Stordalen is a hypocrite? Not so. My point is that a lot of people are looking at her and assuming that the entire issue must be fraudulent because she so obviously isn't walking her talk. Me, I chose to pay attention to my ecological impact a long time ago, and the antics of rich hypocrites aren't going to change that. Perhaps it's telling that she was diagnosed several years ago with an auto-immune disorder called Systemic scleroderma. While it is unknown what actually triggers these types of disorders (genetics seem to play a roll in who is the most susceptible), missing nutrients from the diet may well play a big role. You just don't see these types of illnesses in people who eat traditional foods, except maybe once in a blue moon. Sounds like Ms Stordalen is her own worst enemy. Hmm! That's true, and interesting. Enjoy that bacon! Good to know the UN has given her a platform to lecture us from. I noticed in Dublin lots of vegan ads. Wonder does she bankroll that? I'm not sure whether it's her or some other rich diet crank. Similarly the January issue of the Sierra Club magazine lists dozens of sponsored trips to areas of scenic beauty. But what is the impact of flying to Vietnam or Bhutan, Costa Rica, Kenya,etc.? I sometimes see this sort of thing justified with the idea that if city people get out in the wilderness they will be more interested in preserving it. And I realize that it can be persuasive to say to a subsistence farmer "don't kill the elephant that just destroyed your crops because the rich people who come to see the elephants will spend much money, enough to compensate for your maize." But if the wealthy of the world want to preserve the elephants they could just pay the villagers to be elephant rangers and spare the environment the resource costs of their travel. The thing about that is that those farmers won't see any of the money, so why should they care? A case could be made! Part of me wants to join the hopey train, but I just can't see how it would help, even if legal opinion did shift. Unlike with segregation or big tobacco, the oil industry *hasn't been the only one profiting* by causing emissions, we all also have. Thanks for this! I appreciate hearing from someone who's (a) actually wrestling with these issues and (b) in a position to do something, at least in a small way, about the collective dimension of these choices. I think your take on it is spot on, for what it's worth. I came across the news of this new diet in an article on the Guardian website that included a sample weekly menu which followed the new "guidelines". Remarkably, the local British staples of lamb, fish, cheese, potatoes, etc. were rare, but more than one meal contained avocados, which have to be shipped in, mostly across the Atlantic. It looked like a bunch of hipster food to me, a lot of fancy salads with too many ingredients, and then some buttered toast now and then as if it were a "treat". Needless to say, when I later read about who all was behind it, I wasn't surprised. I've been grateful to be in touch with some young agriculturalists who are strongly backing sustainable, pasture-raised meat and dairy alongside scaling back the big grain monocultures. It boggles the mind how people are grasping on to exotic salads but don't see the sense in local meat and potatoes, and I honestly blame Instagram (and other social media) and how these billionaires' lifestyles are heavily promoted without any criticism or analysis. Maybe this news will spark a turn-around somewhere. Of course! It's class consciousness posing as environmental consciousness. That needs to be pointed out, repeatedly, until it sinks in. I confess to taking a malicious pleasure in the many photos of Ms. Stordalen and her hotel mogul husband reveling in their lifestyle of conspicuous consumption. Their air of self-satisfied triumphalism rivals that of Mr. Toad while driving his favorite stolen motor car. The Mirror did a fine job of using these to good effect. It wouldn't be that hard for a handful of ecologically-minded celebrities to model a fairly sustainable lifestyle, but I'm not counting on it. I think that at this point in history our culture is adamantly determined to drive itself right off the cliff. I wish I could argue. Somehow I'm not surprised. 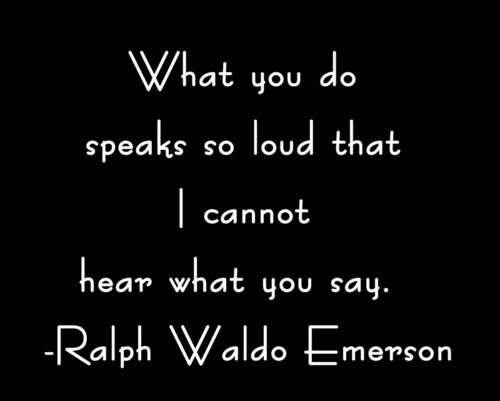 Our culture is filled with people who missed the concepts of Emerson's quote, or "actions speak louder than words", or "you are your deeds", or that brilliant gem "what you contemplate you become". Now two questions come to mind. The first is what is it that the privileged hope to gain by trying to force everybody to partake in their virtue signalling? After all, if everybody did it, it would be useless for signalling class, which is after all what the purpose is? 1) They're not trying to force everyone to partake in their virtue signaling. That's why it's done in a shrill and punitive fashion, to guarantee opposition and resentment. (I don't know if you heard about the Gillette "toxic masculinity" ad campaign here in the US. It's the same thing.) You model positive behavior if you want to encourage change; you scream insults, make threats, and impose fines when you want to get people to dig in their heels, so you can feel morally superior to the people you're exploiting. 2) I think that's an important part of it. To my mind, though, the big picture is that the religion of progress -- the foundation of everything the privileged classes believe about themselves and their world -- is more and more visibly failing with each passing day. Their god is not merely dead but beginning to rot, and as the stench becomes more and more impossible to ignore, those who've committed themselves body and soul to faith in progress, as the foundation of their worldview and the core strategy they use to justify their behavior, are wigging out. Maybe off topic, but what's with the scar/growth on the husband's side/rib cage? What is that? Do you think it might be where the fungus from Yuggoth inside zipped up the human suit? I'm currently reading 'Call of the Reed Warbler' by Charles Massy, which is a book on sustainable agriculture with a focus on Australia. It seems that with careful management of the land, nature can support and even thrive with livestock. Livestock can even be used to help regenerate degraded soils. The key seems to be to mimic the natural behaviour of large herbivores by keeping them in tight 'herds' and not giving them access to new pasture until the grassland has matured. I can't see how replacing a monoculture of cows with a monoculture of (undoubtedly GMO) lentils is going to help that much. I suspect a lot of the push for a meatless diet is that the top 1% want to keep the world population growing indefinitely without total environmental collapse. If people are having less children, it means less people in the future to buy iphones and that means less profits and the whole ponzi scheme starts to collapse. Monocrops of GMO grains however can cheaply keep the masses from starvation and are profitable to boot. At age 38 and having gone 18 years without a car, made my travels by train / bus, and only eaten fish about once a month and bird on the odd Thanksgiving, the hypocricy disgusts me. However, as we’re shouting these people down, hopefully the fact that wasteful jetsetting and industrial meat production do actually deserve condemnation isn’t lost. I know you would agree JMG, but this brief post may not have made that clear, as at least one commenter seems to have mistaken. Otherwise the impression could be all veg-heads and bike riders are grandstanding hypocrites, therefore ecological responsibility is never anything but an authoritarian hoax. Don’t get me wrong, I try to keep a damper over my virtue signals, as the mere admission that I prefer to avoid meat (or sight of me on a bike) is enough to trigger defensive reactions. But if you don’t state your position time and again, people will continue to try and foist it on you, and take great offence if you refuse. I show up for family dinners and they think it’s a compromise to prepare fish every time, like they could NEVER even consider having a vegetarian meal just once. I never asked for the fish, and I don’t need them to cook for me, but they don’t get it (like, hellooo, there’s a reason growing vegetables is my occupation) so I’ve started to decline and it’s been going over like a lead balloon. Anyway, I’m ranting, and it all feels hopelessly ineffectual as a form of activism, but at least I’m not corrupting my temple with that stuff, and I can look myself in the mirror. And I love rice and legumes! practically subsisting on them this winter! (Anonymous) - The Cheese is good! (Anonymous) - Weekly wednesday posts?